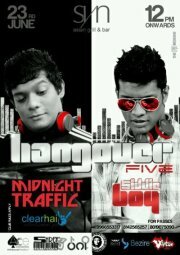 Hangover 5.0 Featuring DJs Midnight Traffic & Siddie Boy @ Syn is an upcoming event in Hyderabad. Passes : Rs.500/- For Guys, Girls can walk in FREE. Avail exciting offers on alcohol and hookah. Three best dressed girls to be gifted Lifestyle shopping vouchers worth 2000 each.